Just days after the accident I (Caleb Phelps) was going through all of the sermons that Chad had preached. It was overwhelming to see how God had used Chad in the ministry of His Word. As I went through the sermons I came across one sermon that immediately struck my attention. It was a sermon that Chad had preached on October 10,2012 to his youth group at Colonial Hills Baptist Church in Indianapolis, IN. 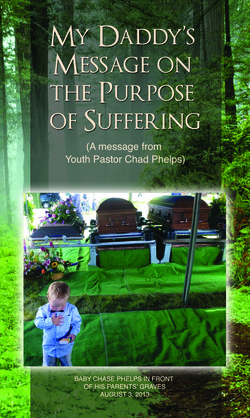 Chad had entitled the sermon "What is the Purpose of Suffering?" I came across the sermon on Tuesday, July 30th. The next day was a Wednesday and I was asked to briefly share something to the church congregation. Through tears I was able to read briefly from this sermon. You can listen to that brief sermon here . That same Wednesday the Governor Mike Pence the current governor of Indiana also spoke as well as the previous youth Pastor before Chad Pastor Joe Fant and my father Pastor Charles Phelps. At the close of the service I went over to a brief gathering of the teens in the youth group. I quickly printed off enough copies of this sermon for each of the teens to have. It didn't take long before I was receiving feedback from many different people who had read or heard this sermon and they all challenged me to see if we could get it published. Thanks in large part to the ministry of Dan Elkins and Audrey Kroening just three days later we were able to have a rough copy of this sermon for all the people who came to the funeral to have one. Since the funeral we have taken time to polish this up and make it into a pamphlet that is now available for purchasing. We have now had more than 50,000 of these pamphlets in print. It is my prayer that you will consider getting some of these pamphlets. I know they will be a special blessing to you. In the weeks after the accident the church family of Colonial Hills Baptist Church bonded together in what proved to be an incredible way. Following the tragedy of July 27,2013 the people of Colonial were a beautiful testimony of God's amazing grace. As grief of the tragedy hit home for them in a very real way they still looked for ways to reach out to others. Below are the links to 13 different messages and services held at Colonial in the weeks following the tragedy. Included in this list are the audio testimonies of the teens that were on the bus. Take a moment and listen to these people talk and see how God so directly impacted their lives. Wed, 7/31 PM — Caleb Phelps: God is Good! Jesus is Enough! Wed, 7/31 PM — Joe Fant: A "Trage-tunity"
It is amazing to see how God can work in the lives of teenagers for his glory. Rather than become bitter as a result of this tragedy the youth at Colonial Hills Baptist Church bonded together and sought to minister to others in their time of grief. The youth group at Colonial Hills Baptist Church is called Youth E.D.G.E. This stands for Evangelism, Discipleship, and, Encouragement. Chad longed for the youth at Colonial to live these principles out in their everyday lives. After the accident a group the teens in youth group looked for ways they could minister grace to people in their community. They came up with rubber wrist bands. Each wrist band that you purchase comes with a tract that was written by the teens (here). The wristbands cost $1 each and are a helpful reminder to pray for those who continue to be impacted by this trial.